The area around present day Sarasota, in southwest Florida, has been inhabited for at least 10,000 years, but discarded fish bones and shells on the bay's shores are the only surviving evidence of the people who lived here prior to European settlement. 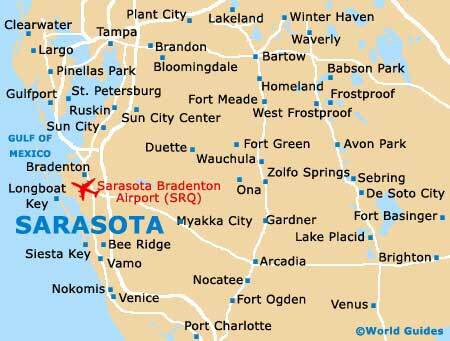 The first recorded European contact with Sarasota Bay in history was a Spanish expedition, which landed directly south of the present day city. 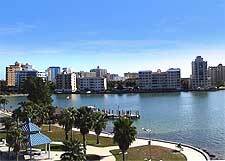 Sarasota was first established as a rural Spanish community that was known as Zara Zote, a name of unknown origins. As Florida changed hands between the Spanish and the English, both Cuban and American settlers fished and traded along with Havana merchants in Zara Zote's bayside fishing camps, referred to as ranchos. Five years before Florida became an American state, Fort Armistead was established along Indian Beach in 1840. The fort was later abandoned due to severe epidemics among the Seminole population and the surviving Seminoles were later forcibly relocated to the Big Cypress Swamp. After more and more European settlers arrived in Zara Zote, the community's name officially became Sarasota and the modern history of the town began. In 1885, Scottish settlers flocked to Sarasota expecting to find a thriving tropical town, but the community was still a primitive place without streets and shops. The few Scottish settlers who decided to stay in Sarasota established the community's first golf course in 1886 - it remains one of America's finest golf courses. They also established the famous DeSoto Hotel in 1887. Another family, the Wilsons, started the first newspaper in 1899, which Rose Wilson continued to publish for 13 years after her husband's death in the year of 1910. Sarasota's history is bound up with that of the Ringling family, who were most famous for the Barnum and Bailey and Ringling Brothers circuses, but they also left their mark on the city in many other ways. John Ringling's circus elephants helped to build the first bridge connecting St. Armands Key with mainland Florida, and the Ringling's Venetian-style estate was one of the most impressive residences built in Sarasota during the 1920s housing boom. Many of the Ringling Museum of Art's exhibits originally belonged to the family's private art collection. Sarasota is also home to the Ringling College of Art and Design, as well as the Ringling Bros. and Barnum and Bailey Clown College. Much of the unique architecture created when the city was a modern-architectural Mecca, from 1941 to 1966, can still be admired at the Sarasota School of Architecture today. Urban planner John Nolen completely overhauled the city layout in 1925, changing downtown addresses to their current forms and making the waterfront City Hall the community's main hub. 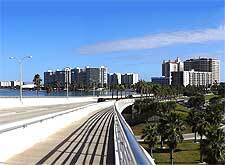 Sarasota also became connected to the Tamiami Trail, between Tampa and Miami. Today, Sarasota is known as West Central Florida's cultural center and its beaches contain some of the world's whitest and finest sand. 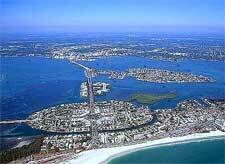 Causeways link the neighboring islands of Siesta Key, Longboat Key and Lido Key.